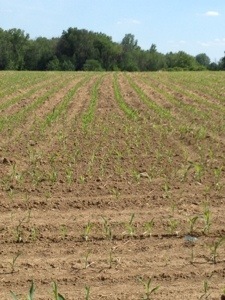 Yea, the corn is growing! Just little corn sprouts for now but last weeks frost gave a scare. Because we planted later than usual the leaves were close to the warm earth. Whew. For city readers, the saying is knee high by 4th of July, then it will have a growth spurt. You know the corn is about ready to pick when it gets tassels on the top. Today marks 30 days until 4th July! For now, my mouth is watering for some corn on the cob, drenched in real butter, add salt. A clam and lobster bake sounds like a winning idea. As for our government as of late, I can think of a few politicians who could use a day on a farm, meet the real people that they work for. May be tempted to shove a cob in the pipes. Oh my! Kidding kidding! And this business about collecting DNA, what an abomination from SCOTUS. The government can’t figure out DNA In genetically modified food for heck sake. Arg mates, praying for a bit of rain and some better transparency from DC. Oh and the best part of the day- neighbor farm- Day One Strawberry Picking! Here’s a sneak peek photo of the corn nubs.